There is truth in the phrase, “necessity is the mother of invention.” Throughout our early years, clients who brought bound material such as books and periodicals had to endure the destruction of those materials in order to have them digitized. There wasn’t a way around it – or was there? Always on the lookout for new and innovative ways to meet our clients’ needs, I had learned about a scanner called the Archivist that would accomplish what at one time could only be imagined — excellent digital quality scans of bound materials without causing any damage to the spines. Before purchasing the Archivist, if a client had a project where the spine could not be removed we had to enlist the help of an a outside vendor that specialized in non-destructive scanning. This added additional time and cost to the job. Now, we can keep these projects in-house and provide much-improved turnaround time and pricing to our clients. A unique aspect of the Archivist is that the scanner comes as a kit, which means once it is put together, it can be adjusted based on the needs of the project. This made the scanner even more attractive to add to our ever-growing scanning options. A few months after I first saw the scanner online, the custom-built Archivist made its debut at Pinetec. The design is innovative but the idea is simple: two cameras are mounted securely on the top and are aligned to point directly at the pages to be scanned. Pages are gently flattened by the glass cover that lightly sits on top of the material; this light pressure on the pages keeps them in position to produce consistent high-quality results. 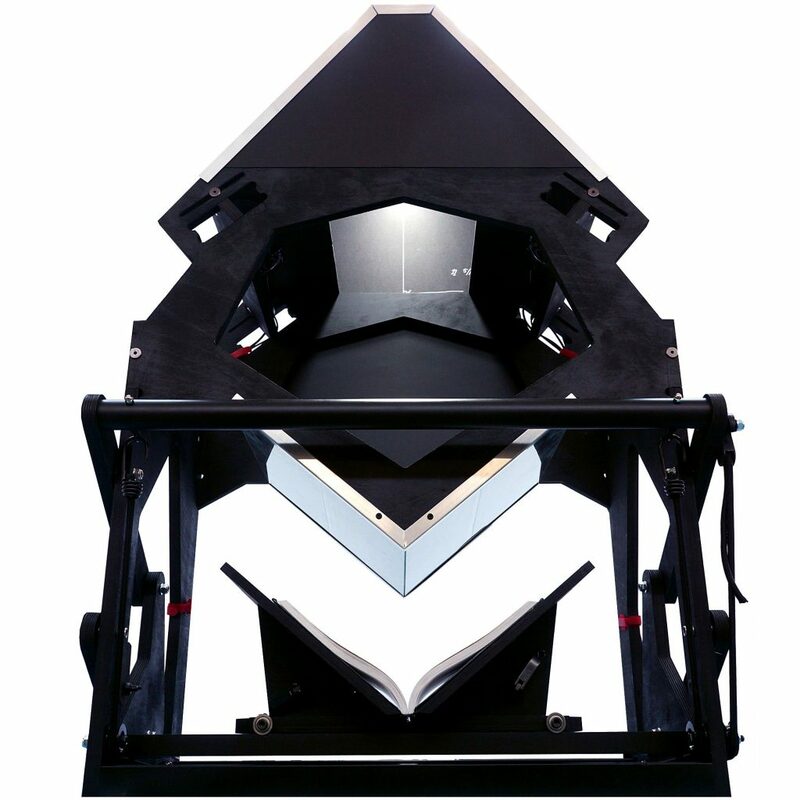 The cradle supports the back and spine of the book, minimizing any wear that traditional scanning can cause by stressing the binding when it is laid on top of a scanner bed. Because the scanner was built on-site by Pinetec technicians, upgrades can be made easily and frequently. Let us show you how the Archivist can deliver clear, crisp digital scans without destroying the the integrity of your material.